It is … beneficial to adopt a compass that dictates what is good and right in information architecture—in essence, a professional compass for information architecture. In the social context of human engagement, there is a concept called a moral compass. A person’s moral compass generally guides one to do what is socially good and right. Exercising one’s moral compass offers reliable guidance for one’s future actions and decisions in ways that are holistically beneficial to society. For information architecture and UX design professionals who regularly tackle information architecture (IA) problems, it is equally beneficial to adopt a compass that dictates what is good and right in information architecture—in essence, a professional compass for information architecture. In this column, I’ll demonstrate that, with an IA compass in place, expressing the value that information architecture delivers to a business becomes clearer. The IA compass that I’ll describe is absent of theoretical and technical rhetoric and focuses on a greater good. This greater good is one that is most likely to resonate with our business and marketing colleagues. While it is important that they acquire a general understand of information architecture, they are more interested in how information architecture fits into their business model and delivers value. As a point of reference, I‘ll discuss my own compass for information architecture, which I developed as part of my research for the DSIA Research Initiative. While the ideals that we’ll review won’t be foreign to many of you, recognizing these simple principles as a professional compass that benefits the organizations that we serve, might be a new idea for you. First, let’s look at the greater good. Companies’ … deepening commitment to the Web as a primary touchpoint for commercial and operational engagement was an outcome of the measurable financial gains and operational improvements that they associated with Web technology. Prior to the commercialization of the Internet, companies maintained successful business relationships primarily through a great deal of personal interaction. In fact, if it weren’t for the Web, service design might have become legitimized much sooner instead of evolving to what it is today by riding the wave of the UX design movement. In the ’90s, the rapid ascendance of the Web quickly displaced what was then a rising awareness of the competitive advantage a company could gain by providing a heightened level of customer service and memorable experiences in physical spaces. 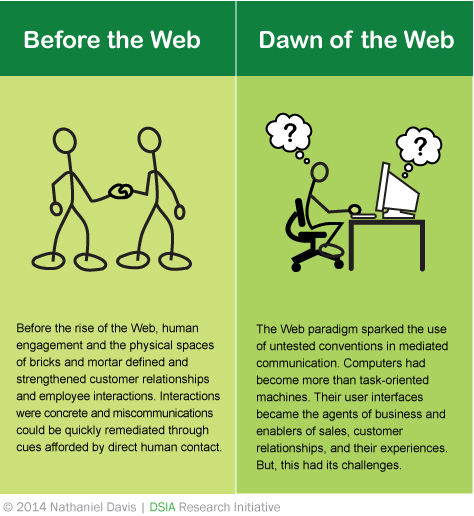 Instead, the focus shifted to how people interact with each other in the then new digital space. The Web would introduce businesses and hundreds of millions of people to the nascent science of nurturing customer relationships and employee productivity through mediated communications, as represented in Figure 1. It is important to understand that business leaders and operational decision makers think in terms of performance, functions, and tasks. These are the quantifiable chunks of any business’s operations that collectively represent the underlying context of a business. Despite companies’ general lack of understanding of mediated communication, their deepening commitment to the Web as a primary touchpoint for commercial and operational engagement was an outcome of the measurable financial gains and operational improvements that they associated with Web technology. By allowing commerce to take place anywhere and at any time, the Web was reshaping time and space. The rewards for doing business on the Internet seemed far greater than the risks—at least until the hype and the rush to use Web technology settled down. But today, conventional wisdom about the Web has repeatedly proven that the risks actually threaten the rewards. Poorly managed information threatens to undermine the effectiveness of user interfaces that relate to revenue generation and operational functions. This is where the practice of information architecture adds business value. At the epicenter of risk and reward is a user interface (UI) engagement that focuses on information in some form of consumable or interactive content. By the end of the ’90s, there was a lot of information on the Web. Now, after the Web’s almost two decades of existence, there is a whole lot of it! And, from the evolving science of mediated communication, we know that poorly managed information threatens to undermine the effectiveness of user interfaces that relate to revenue generation and operational functions. This is where the practice of information architecture adds business value. In this age of big and little data, information anxiety, and the exponential propagation of information on the Web, the practice of information architecture is the leading discipline seeking practical solutions and strategies for simplifying the way people navigate and use information that connects to the Web. This statement reflects my professional compass for information architecture and is the way I communicate the role of information architecture to nontechnical audiences. In the remainder of this column, I’ll briefly describe the principles of my IA compass, shown in Figure 2. I hope this helps you in developing and applying your own information architecture compass as you engage in future IA activities. When you use your IA compass in your work, you’ll be contributing to a greater good that builds business and organizational value. Push for an intuitive solution. Focusing on simplicity always improves the act of creating an information architecture. Focusing on simplicity always improves the act of creating an information architecture. Simplicity often correlates to relevance and is congruent with intuitiveness. When you think you’ve finished your information architecture, challenge yourself to make your solution even simpler. Consider the importance of abstraction. Abstraction is a central technique of information architecture. It promotes scalability and reuse. These are crucial concepts that resonate with organizations that have complex information technology (IT) and enterprise architectures. Explore ways to organize and create useful relationships between information. In IA practice, there are two fundamental areas of interest that, with logical planning, contribute to simplicity and give rise to a coherent information space. These are defining information organization and information relationships. When you formally organize and relate information at a conceptual level, this naturally provides a framework upon which you can craft the intended digital experience. Taxonomies and ontological models are essential techniques that shape information spaces to fit the mental models of a system’s users. To practice information architecture, one must understand that people are multidimensional and that their engagement extends beyond a software user interface and connects to broader experiences and contexts. Historically, human-to-computer interaction (HCI), user-centered design (UCD), and interaction design (IxD) practice have dealt with user interface design as the point of engagement. Their focus has been on users and human factors. This is no longer enough. The Web paradigm for delivering content to a user interface recognizes that computing interfaces must understand people. Consequently, to practice information architecture, one must understand that people are multidimensional and that their engagement extends beyond a software user interface and connects to broader experiences and contexts. 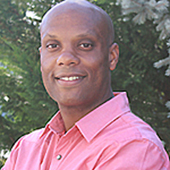 Language, culture, and a person’s unique perspective are typical factors that help to inform an IA strategy. This does not mean that practicing information architecture includes the performance of linguistic analysis, ethnographic research, and usability testing. But it does mean that an IA solution must ask questions whose answers are informed by the insights of professionals working in these areas of interest. Provide the primary pathway to information. As the information within a domain grows, certain items become more difficult to discover. The pathways that we offer to users must appear natural, be efficient, and remain engaging. It is important to provide primary pathways. Primary, or formal, pathways are structural and, as a result, persistent. Thus, an information architecture that you create provides routes that users cannot directly alter. In addition to providing persistent navigation, be sure to consider people’s use of informal pathways that allow the emergence of unexpected wayfinding behaviors. Tag clouds and site search are examples of informal modes of navigation. As the information within a domain grows, certain items become more difficult to discover. The pathways that we offer to users must appear natural, be efficient, and remain engaging. When operating in a content-managed environment, it is especially important to model information to be as flexible as possible. When modeling the content in your target domain, consider that it will be both formally managed by business and subject-matter experts and informally determined by non-experts. While you must consider user needs, give equal attention to how the business will manage its information. Functional responsibility for information architecture may include having to probe a broad range of needs—from individuals who author business models and rules, marketing, communications, information systems, and so on. Domain modeling is a powerful technique that we can use to explore meaningful information and content relationships. Also, explore ways to measure the integrity of your site’s information architecture using IA analytics. When you can observe online usage patterns and trends to verify the effectiveness of an IA solution, you can build a quantifiable business record and a sound perspective on information use and behavior within a business context. So, become familiar with setting key performance indicators and quantifying the return on investment for your IA strategies. Master the ways people connect on the Web. The Web is the singular factor that distinguishes the interests of information architecture from those of the traditional practices of information organization, use, and management. The information that we consume on the Web is not static like that on a physical page in a book. It lives in emerging states on clients and servers and gets delivered, on request, to computing interfaces on an unlimited range of devices. This distributed environment is the essence of the Web and raises new challenges in communications and in the display and sharing of information. The Web is the singular factor that distinguishes the interests of information architecture from those of the traditional practices of information organization, use, and management. Information architecture has a responsibility to connect a Web of Experiences (WoE) across the Internet of Things (IoT). Therefore, it is essential that we plan to ensure the integrity of information and communication across a vast web of potentially unlimited, mediated interactions. If you're a practicing information architect or a UX professional who takes on IA tasks, be ready for the tough questions that may force you to explain the business value of information architecture. An IA compass can be an invaluable source of guidance in answering such questions and representing the practice of information architecture with business integrity. Davis, Nathaniel. 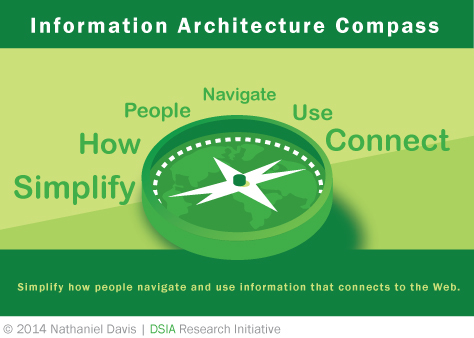 “The Business Function of Information Architecture.” The DSIA Portal of Information Architecture. Retrieved January 15, 2014. Davis, Nathaniel. “Getting Your Web Site’s Structure Right.” UXmatters, April 22, 2013. Retrieved January 15, 2014.